You are here: Home / Christian Talk / Yeshua vs. The Jesus Deception. Christians Voice Your Opinion. Yeshua vs. The Jesus Deception. Christians Voice Your Opinion. (ThyBlackMan.com) Accuracy, hmmmm. A term that people tend to shun or forget about. And when it is brought up, those so accustomed to living under deception get mad or even reject the truth. Every Sunday Christians and Catholics (and yes I am a born-again child of God, a believer) call on the name of Jesus – the name they believe to be above every name. But there is just one big problem. The Messiah’s name is not Jesus and it never was. The breakdown of the meaning of words is called etymology and each word has its own meaning in different languages. Therefore when you change a word from its original language, you very often change the original meaning of that word. For some words it may not be a big deal. But if you are going to call on the name above every name (Philippians 2:9), then you need to use the correct name and there is no getting around that. The Messiah (for those who accept Him) was Hebrew – not Greek, not Latin and not English. His name was Yeshua – not Jesus and not whatever each language wants to call him. In the Bible it is clearly established by God that a different name produce a different meaning. You don’t have to speak Hebrew on everything but you should call on the correct name of the Messiah – a name filled with power and purpose, not inaccuracy, changes or translation. It is in fact God who changes the names, not man (Isaiah 56:5, Isaiah 62:2, Isaiah 65:15, Rev 3:12). And if God does not change the name of the Messiah, man should not dare to do so. God changed Abram to Abraham, Sarai to Sarah and Saul to Paul. Likewise God gives the believer (child of God) a new name ( Rev 2:17). And as you see in Revelations 3:12, even the Messiah has a new name. But because that name has yet to be revealed, we call Him by His Hebrew name – Yeshua. Do not confuse this with how Jehovah’s witnesses want to say God’s name is exclusively Jehovah. God, the Father, is known by many names just as the Son is known as Yeshua and Emmanuel. But the Jehovah’s witnesses inaccuracies are a discussion for another time. 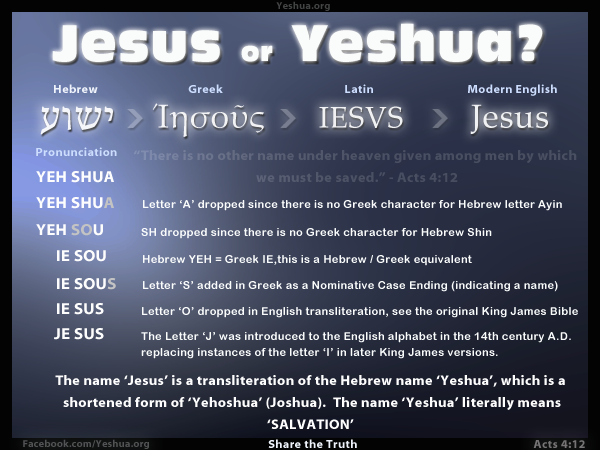 The name “Jesus” is a transliteration into English, not a translation. It came from the Latin form of the Greek name “Iesous”. But the Messiah was neither Greek nor Latin. And though the New Testament was translated from Greek, there is no letter “J” in Greek nor in Hebrew – unless they recently added one to cover their lies and inaccuracies. What harm can it do to call the Messiah “Jesus”? Great harm. First of all it is inaccurate and thus wrong. Secondly it is adding to the Word of God or taking away from it – both cases that cause one to be cursed (Deuteronomy 4:2, Revelation 22:18-19). Thirdly what is wrong, cursed, deceptive and inaccurate cannot set you free. The Bible is clear that you must continue walking in the truth (John 8:30-36) and the truth must be in you in order to set you free. That truth it speaks of is not just knowing the truth but also having the Truth inside you (the Messiah via the Holy Spirit per John 14:6). Fourth of all, it is not rightly dividing the Word of truth as we are commanded to do if we use inaccuracies and make excuses for doing so (II Timothy 2:15). Maybe one of the biggest dangers of all is what the catholic church has done. Along with the name “Jesus”, His look has been altered and falsified to look more like a European Caucasian male. Statues, pictures like the fake one on the front of your grandmother’s old Bible have deceptively shaped and reshaped our perception of who the Messiah was and is. One could argue that was intentional because slaves were easier to control if the slave master resembled the “Messiah” and the slave did not. So you see the changes did not stop with the name. There are at least three general or “major” church communities that exist today, all of which seem to call on the Messiah. The first is the real church that Yeshua founded and that He alone is the Head of. The second is the catholic church but not mentioned anywhere in the Bible and not at all Christian i nature (https://www.youtube.com/watch?v=GQhW9vAwCqM). Nor is the Pope. The third is what I call the “Christian” religion – denominational and non-denomination offshoots of the catholic church, many of whom were birthed through the protestant reformation (Lutheran, Presbyterian) and others following somewhat after John the Baptist (Baptist, Southern Baptist, National Baptist). Along with changing His name, they changed His image to look like a Caucasian European (Romans 1:23). Then they used His teachings to subvert and control the masses through organized religion (Gal. 1:8-10), not relationship (Rom 8:16-17). Then they twisted His teachings to fit their own missions, agenda and objectives. He warned us of “another Christ” in II Cor. 11:4, “another gospel” in Gal. 1:8-10, false apostles in II Cor. 11:13 and adding to God’s word or taking away from it in Prov. 30:6, Rev. 22:18-19, Deut. 4:2 and Deut. 12:32. But they continue to do it anyway and many of you refuse to see. The Lutheran and Presbyterian churches are commonly known as the Protestant church. The Methodist Church, however, was not produced by the Messiah. It was instead the product of a movement started in 18thh century England by John and Charles Wesley. As for accuracy, none of the churches in the second or third group were founded by the Messiah – Yesuha. Not surprisingly all of their origins can be traced back to men, not Yeshua. Just the facts – like them or not. So you see accuracy means everything when it comes to the Word of God. But too many “churches”, denominations and groups have a problem with the truth. They are the wheat that has grown up with the tares. They have a form of godliness but deny the power thereof. The Bible calls them “another gospel” (II Cor. 11:3-4, Galatians 1:8-9) but clearly not THE Gospel of the Messiah. And they are comfortable to go right on making changes and promoting inaccuracies and deceptions. They call the Messiah by a different name (the transliterated excuse). They change His appearance. They twist and distort His teaching. They go off on their own missions, behaving more like the Pharisees. And they set up their own churches, pretending to be His. All the while many of them simply promoting themselves, not the Messiah. all the while leading unsuspecting people further into darkness (Matthew 23:15, I John 1:6). This has to stop and the first stage of stopping it is to expose what is really going on – like it or not. As for you, the anointing you received from him remains in you, and you do not need anyone to teach you. But as his anointing teaches you about all things and as that anointing is real, not counterfeit—just as it has taught you, remain in him. But the anointing which ye have received of him abideth in you, and ye need not that any man teach you: but as the same anointing teacheth you of all things, and is truth, and is no lie, and even as it hath taught you, ye shall abide in him. What do man-made churches fear? Because church leaders in control of the masses fear the awakening of God’s people to 1 John 2:27, they have what they believe as justification to change names, twist doctrine, mislead/deceive/misinform people and make excuses for all of the above. And the scripture that asks how can you hear without a preacher is a question, not a definitive statement. Wake up people. Wake up. Matthew 23:23 Woe unto you, scribes and Pharisees, hypocrites! for ye pay tithe of mint and anise and cummin, and have omitted the weightier matters of the law, judgment, mercy, and faith: these ought ye to have done, and not to leave the other undone. 24 Ye blind guides, which strain at a gnat, and swallow a camel. People we have to stop making excuses for lies, deceptions, hidden agendas and inaccuracies that people, even though imperfect as we all are, keep perpetuating. Lies and deceptions war against the truth and thus war against He who is the Truth and the very core of righteousness itself. Do not dismiss lies and deception so easily. God is a God of truth, right division of His word and honesty. We all have opinions but the truth and fact consistent in scripture is that names are important and lies and deception are not of God. God can be concerned about several things at once – not one vs the other. It’s about correction and truth so don’t minimize attacks against truth as simple pronunciation. a simple study about how the Father and the Son see such verifies what I have just said. It is about truth, not just what we want to believe. Names do matter to God and very much so. God changes Abram’s name to Abraham and so on. It is also a matter of truth which demands accuracy and rightly dividing the Word of God. Furthermore the Bible commands us to correct those in error, not just to let them continue to believe lies. So to ignore that directive also presents a problem of disobedience. Christ corrected others and we are to take up our crosses and follow HIM as our example. The name Jesus has no power and those who think it does have been lied to. But it goes even deeper because those who fake the name of the Messiah also promoted fake pictures of Him such as the one pain ted of Caesar Borgia immortalized as he impersonated Christ. He was painted by his gay lover, Da Vinci. Do the research and find out the facts for yourself. You see the deception was also about slaves in America believing that the Messiah looked like the slave masters and never anything like the slaves. I could go on but deception and lies, especially with hidden agendas, are never godly and never harmless. Anybody gaining peace from a lie or deception has a false peace. And from all we know of Christ, He clearly teaches against such foolishness and unrighteousness. In my humble opinion, GOD is more concerned about what you believe and how you live (Obey Him, Love Him and others, Forgive others) than in how you pronounce HIS name. The Bible ways to avoid foolish arguments. You are free to believe whatever you want but I would be careful about condemning others based on your particular obsession. Thanks for such a passionate article. Yeshua, Jesus, this matters to the mind and understanding. However Many people have found peace, guidance, new life, healing and redemption calling the name of Jesus. My belief is that Our Creator is beyond names and into hearts and souls, thoughts, intentions and motivations, more concerned about our personal relationship etc. So now that we know the true name of the Messiah, we can call it. But I don’t thing He is upset with the millions who believe and call Him Jesus. 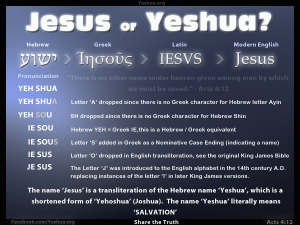 I have been following this research and arguments and wonder why we can’t just accept that the name Was translated from Hebrew into Greek, like say Joseph which is Yosef in Hebrew and leave it at that. Not a malicious plot to mislead the world into worshiping the false name of the Messiah. History is full of this type of translation, adaptation and reinterpretation based upon language, culture and perspectives. Much like this article that you have written. Many of you have been deceived, in the dark and lied to for so long when you thought you were walking in the light. Thus you cannot see nor hear the truth because it sounds so strange. And that is why you reject it.